Every year since 2007 Applebees has offered a free meal to veterans. This year is no different. Applebees will be offering free meals on Veterans Day to any veteran or active duty military personnel. Check the Applebees website to find out what kind of identification will be accepted to take advantage of this deal. On Friday, November 10 IHOP will be honoring our men and women in uniform by giving away a free stack of red, white and blue pancakes to all veterans and active duty military. You must show proof of service before receiving this offer (show up in uniform, have a photo in uniform or military ID). You can visit Chili’s on Saturday, November 11 and take advantage of the free meals for Veterans Day. Like the other Veterans Day freebies, you will need to show proof of service or prove that you are still serving in the U.S. military. On Friday Krispy Kreme is offering a free donut and coffee to every veteran or active duty military personnel. You will have to dine in to take advantage of the offer though. It will not be available via drive-thru. Another place to get a free meal on Veterans Day is Olive Garden. Get your free meal by presenting one of the following: a military ID, U.S. Uniform Services Retired ID Card, Current Leave, and Earnings Statement or Veterans Organization Card. On Friday, November 10 all active and non-active military personnel can receive a free Build Your Own Grand Slam Breakfast. This offer is only available at participating Denny’s from 5 a.m. to noon. Outback Steakhouse will be giving away a free Bloomin’ Onion and beverage to every veteran and military member on Veterans Day. The restaurant is also giving out a military discount of 15 percent off the total check from November 12 until the end of the year. From 5 p.m. to 9 p.m. on Monday, November 13 Golden Corral buffet is offering one free buffet and free beverage to veterans and active duty military. This includes retirees, veterans, National Guard or Reserves. No identification is required for this free meal. On Saturday, November 11 veterans can receive an appetizer or dessert at Red Lobster for free. Veterans can enjoy a free lunch on Veterans Day at Texas Roadhouse. This offer is dine-in only and the hours in which the free meal is available may differ from location-to-location so be sure to call ahead and confirm with your local Texas Roadhouse before heading out. TGI Fridays will be giving free meals on Veterans Day to any veteran or active duty military personnel. This offer is valid from 11 a.m. until 2 p.m. You will be required to provide military ID to get this deal. O’Charley’s offers a 10 percent discount for active duty military and veterans all year round. On Veterans Day, vets and active duty military can get a free meal. Military members will be able to get a free meal from the $9.99 menu at participating O’Charley’s locations. From 3:00PM to close on Veterans day veterans, U.S. military and U.S. military spouses get a buy one get one free burrito, bowl, salad or taco. Dunkin is honoring veterans by giving away free donuts to all active duty military and veterans on Saturday. Veterans and active duty military will receive a free Red’s Tavern Burger and steak fries at participating restaurants. Call ahead to confirm. 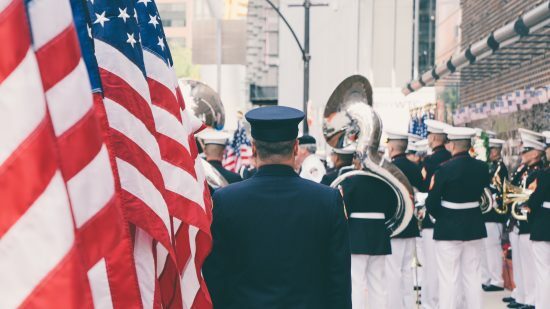 If you or a member of your family is a veteran or active duty military Saturday is the day to take advantage of some of the great deals being offered as our way of saying thank you for your service. Remember many of the offers require proof of I.D. or a uniform. Most stores and restaurants are open on Veterans Day. 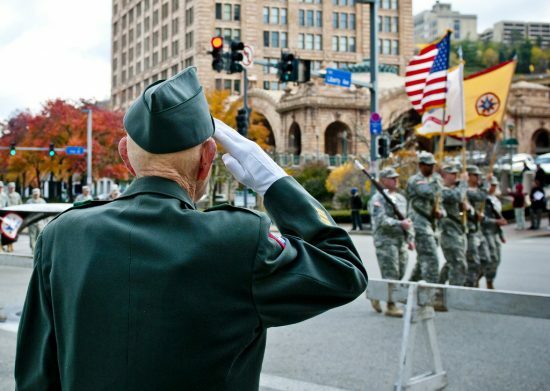 Many restaurants offer either a free meal or a free appetizer to veterans on Veterans Day. Below is a list of restaurants that will offer a free meal to current or former military personnel on Nov. 11. Bar Louie is offering free lunch or dinner (up to $12) to active military and veterans on November 10th & 11th. You must dine-in and show proof of military service. California Pizza Kitchen is offering active, former or retired military a choice of free pizza, full size salad, or pasta from the special Veterans Day Menu. You must dine-in and show proof of military service. Chili’s is offering a free meal to active military and veterans. Options for this free meal include: Oldtimer with Cheese, any lunch combo, Soup & Salad, Grilled Chicken Salad, Chipotle or Margarita Chicken Fresh Mex Bowl, Grilled Chicken Burrito, Southwest Pairings Pick-2, and Any Full Size Flatbread. Proof of military service is required. Active military and veterans will receive a free Build Your Own Grand Slam Breakfast at Denny’s on Veterans Day between 5:00AM and noon. Must dine-in and show proof of military service. Fox & Hound is offering active military veterans a free meal or beverage (up to $10). You must dine-in and show proof of military service. Friendly’s is offering veterans a free breakfast, lunch or dinner. Options include a Big-Two-Do meal, which includes a coffee and the choice between two slices of French toast, two buttermilk pancakes, or two slices of regular toast. Breakfast also comes with bacon or sausage links, and two farm fresh eggs. Lunch or dinner includes an All-American Burger served with fries and a beverage (soda, ice tea, or hot beverage). You must dine-in and show proof of military service. On Wednesday, November 11, 2015 from 5:00 PM to 9:00 PM, Golden Corral will be giving out Veterans Day free meals and a beverage to any person who has ever served in the U.S. military or is on current active duty. This includes retirees, veterans, National Guard or Reserves. No identification is required. IHOP is offering veterans a free stack of Red, White & Blue pancakes. Not all locations are participating. You must show proof of service. Little Caesar’s is offering active and retired military a free pizza between 11am and 2:00pm on Veterans Day. 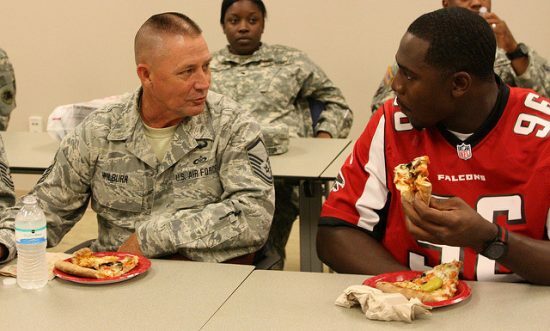 Military members can choose between a free pizza and $5 Lunch Combo. Proof of military service is required. Not all locations are participating. Max & Erma’s is offering active and retired military a free Best Cheeseburger in America 3-Course Combo which includes choice of Tortilla Soup or side House Salad, a cheeseburger, endless seasoned french fries, and a fresh-baked chocolate chip cookie for dessert. A beverage is not included. You must dine-in and show proof of service. Veterans can choose a free entrée from a special menu of Olive Garden’s seven most popular items. All of these entrees come with freshly baked garlic bread sticks and a choice of unlimited soup or salad. Proof of military service is required. On The Boarder is giving active military and veterans a free Create Your Own Meal Combo where they’ll get to choose 2 or 3 selections of soup, salad, tacos, tostadas, enchiladas, and other classics. Dine-in only. Proof of military service is required. Red Robin is offering active military and veterans a free Red’s Tavern Double burger and Bottomless Steak Fries. You must dine-in and show proof of service. Not all locations are participating. Shoney’s is offering a free All-American Burger to active, former and retired military while supplies last. You must dine-in and show proof of service. Texas Roadhouse will be offering free lunch to all active, former or retired military. Veterans will have a choice of steak, country fried chicken, country fried sirloin, pulled pork, grilled pork chop, cheeseburger, BBQ chicken sandwich, pulled pork sandwich, grilled chicken salad, or chicken critter salad. Plus, your choice of sides and a coca-cola product, tea, or coffee. You must dine-in and have proof of military service. Village Inn is offering active military and veterans free breakfast all day on Veterans Day. Choices include a stack of buttermilk pancakes, free French toast, or a Belgian waffle. Wednesday is free pie day so veterans can also receive a free slice of pie. Krispy Kreme is offering veterans a free donut and coffee. Not all locations are participating. Active duty military, reserve, and military veterans can stop by Red Lobster and get a free appetizer or dessert on Monday, November 9 through Thursday, November 12, 2015. Must dine-in and show proof of military service. They get to choose from any of these appetizers: Sweet Chili Shrimp, Parrot Isle Jumbo Coconut Shrimp, Lobster-Artichoke-and-Seafood Dip, Lobster-Crab-and-Seafood-Stuffed Mushrooms, Lobster Pizza, Signature Shrimp Cocktail, Crispy Calamari and Vegetables, Mozzarella Cheesesticks, Crispy Shrimp Lettuce Wraps, White-Wine-and-Roasted-Garlic-Mussels, and Shrimp Nachos. Dessert options include the following: Warm Chocolate Chip Lava cookie, NY Style Cheesecake with Strawberries, Carrot Cake, Warm Apple Crostada, and Chocolate Wave. Ruby Tuesday is offering veterans a free appetizer. Not all locations are participating. Proof of military service is required. Starbucks will be giving out free tall brewed coffees to veterans, active-duty military, and their spouses on Veterans Day. Not all locations are participating. Tim Hortons is offering a free donut to veterans. Proof of military service is required. Although stores and restaurants are open, some businesses do close in observance of the holiday.